In Bangladesh, Yayasan Khazanah is in collaboration with Yunus Centre which liaise with top universities and schools in Dhaka as well received nomination from Grameen Bank and Grameen Shikkha on potential candidates for the scholarship award 2016, and Grameen Bank to offer scholarships to the children of Grameen Bank members to pursue undergraduate degrees at selected leading universities in Malaysia. 4. Applicants will need to show evidence of leadership skills, through active participation in extra-curricular, social or voluntary activities. 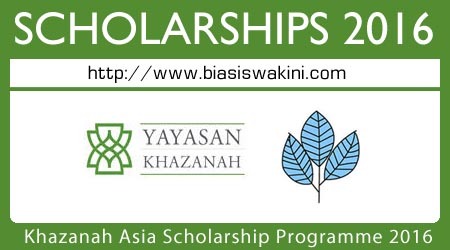 0 Komentar untuk "Khazanah Asia Scholarship Programme 2016"